I am on vacation. I am spending Christmas wih my family and with my wife's family. This is how we spend Christmas. A few days and up through Christmas Eve with my family, and Christmas Day and a few days after with my wife's family, only 60 miles away from each other. We leave the confines of home and our little corner of the world to visit family and spend time in the areas we grew up and had our early Christmas's. I have realized that as much as I love keeping up this blog, I do enjoy vacationing and am not much for using a laptop. I'm writing on one now, but I probably won't do another entry until next Tuesday. So - I pray that you all have a very Merry Christmas celebrating the birth of Christ, and that you have wonderful times of visiting with and enjoying your families! I am an old fashioned kind of guy. My ultimate Christmas dream would be that the whole family arrives for the days festivities and then the snow starts – or really starts to come down. We have a huge stock pile of wood in the living room and the fire is roaring. There’s talking, laughing and maybe even singing at the piano. There’d be a lot of hot chocolate, cookies, great food and lots of treats. There’d be a mandatory pick-up game of snow-football, or at least a huge snowball fight, with a time of warming up in front of the roaring fire with the whole family. So – as Christ mas is fast approaching, do you get to have a white one? 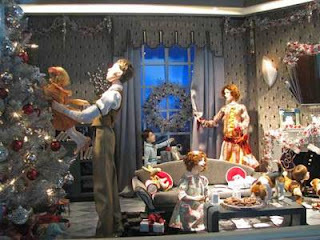 Or –did you have some gre at white Christmas’s growing up? Christmas Memories - The Food! Where would a discussion of Christmas be without bringing up the food? There’s so. much. food. When I was young, we had a bunch of family… including Grandmothers, aunts, uncles cousins, etc… there was about 20 of us that gathered every year. We celebrated Christmas on Christmas Eve so my mom drew the line at dinner, and we would actually go out for dinner. 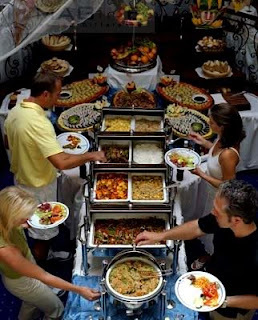 Before you think that we were rich, I need to let you know that we would go to the Royal Fork – which was a family buffet restaurant. Everyone could eat whatever they wanted for the same low price. This was especially helpful when we started having a fair amount of teens in the mix. So – we’d go out and pig out and then come home to a huge layout of Christmas treats. 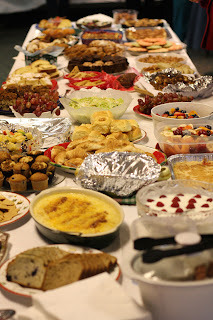 Tons of sweets, different salads, sausages, little dogs in bbq sauce, candy, rolls, pies, cookies, etc, etc, etc. There are a few dishes that were always the standouts. 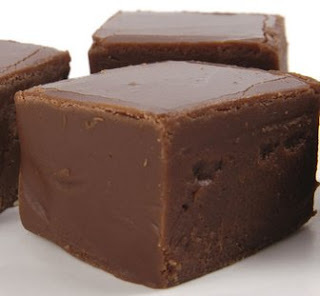 My mom’s fudge is still – to date – the best fudge I’ve ever tasted, homemade or store bought. Smooth as silk, never grainy and so chocolatey! And – my mom’s shortbread was also the best I’ve ever tasted. There were so many incredible things there – and many of them we only got once a year – so we HAD to eat at least some of everything. We’d spend the next few hours just snacking and snacking and snacking. As always, we started opening Christmas presents at midnight – that’s right – midnight. And each person opened their present’s one at a time. We wouldn’t finish until like 3am. We’ve changed this in the last few years so now we finish up by midnight. But – we’d spend the next few days eating all the great leftovers What great Christmas food/treat tradition memories do you have? We had plenty of decorations that went up all around the house, and we had fun putting them all up. Since I grew up in a house full of kids – there were four of us – by nature, we were competitive. 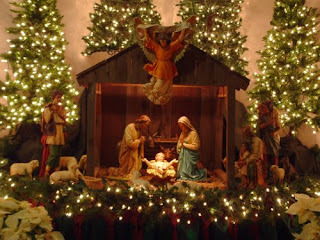 We had a beautiful Manger set and it had all of the classic pieces. Every year we would all want to be the one to find Baby Jesus. All of the figurines were wrapped in tissue, and we had our own silly rules in “the search for Jesus”. You couldn’t just rifle through the box and try to grab the smallest one in hopes of finding it, you had to unwrap whichever one you pulled out and place in the crèche. There was no prize or special recognition for finding the Baby Jesus – just bragging rights that seldom lasted longer than the evening. But – YOU remembered! And every time you looked at the scene you knew that it was YOU who was responsible for Baby Jesus this year. We had these extensive little village scenes. These weren’t fancy set-ups, but they still had a magical air about them. The snow was just sparkly, fluffy cotton, and the buildings we kind of small and didn’t light up or anything. The trees were a bit oversized and had steel wire trunks with pipe cleaner type material tha t were the branches. They did make a good cone shape with some big clumps of fake snow on them and little platforms so they stood up. The funniest thing was that mom picked up some plastic elk that were WAY oversized. This was always humorous to me, but we still put them up. My brother and I would secretly have little terror episodes of the attack of the mutant elks. There were al so lots of little individual decorations that we put up all over - all part of our own traditions. One other cool thing we did was that Mom always made her own door decoration. My brother and I always had to find downed branches for mom to use. They weren’t really fancy or anything, but they were always homemade and originals. What memories do you have of your decorations? The simple joys of childhood at Christmas. This time of year typically causes us all to reflect on our family life growing up. I was very blessed, as I’ve mentioned before, to have been part of a great, caring and loving family. Sure, we had our problems and quirks just like any other family, but we had a foundation of love – mentioned or not – and that was one of the ties that bound us together. Some of my memories at this time of year are special ones. 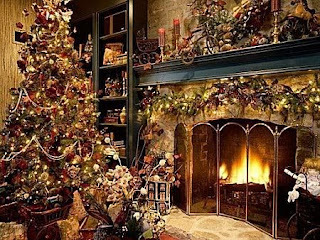 I remember after having decorated the house for Christmas, I would often just cuddle up on the couch and gaze at the wonder of the decorations. The tree was very special. We always had a real one, but never anything fancy. 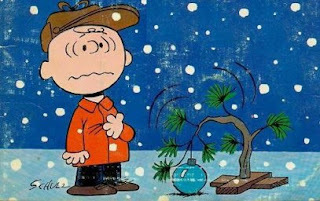 It wasn’t ever a Charlie Brown tree, but it was also never a Noble Fir. Usually just an average pine bought at the local department store lot. Decorating the tree was always a family affair. There were too many cool things to miss out on if you didn’ t help. We had tons of great ornaments. Mom would buy one set of new ornaments each Christmas and would diligently write the year on each box so we would all know when they were bought. Some were tacky, some were cool, some were kind of lame, but they all played a part in the memories of each Christmas as we put them up. We would put the lights on first. These were smaller version of the outdoor lights that got hot and caused more than a few burn spots on our rug over the years. Mom usually had to put these up while we waited impatiently to start doing everything else. 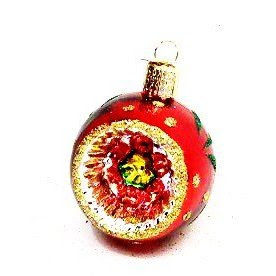 There were the ornaments each of us kids had made at one time in a grade school class that were so important to have in plain sight. Mine was a little cutout of my singing head glued on a wooden sherbet spoon wrapped with a construction paper angel robe and stovepipe harms holding a hymnal… I was a little angel! There was the collection of handmade Santa Clauses. There were some from all four of us kids: the ones with rotating arms and legs using paper fasteners; the ones just cutout, the ones with cotton glued on for the beard, coat sleeves and waist and the top of the boots. All of them meticulously colored (quality dependent on our age at the time of creation) and all with our names and the date written on the back. There were even a couple from when my mom was a kid… still carefully preserved and hung with pride every year. 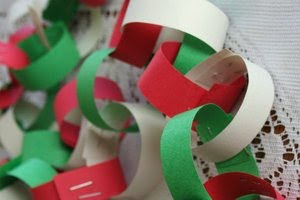 There were the construction paper links garland that my brother and I made as a gift for the family one year; and the handmade needlecraft ornaments from my Nana; and the special top that we put on every year. We all loved hanging tinsel – we called them icicles – and we had the old boxes of the ones that had *gasp* LEAD in them. They weren’t the cheap mylar ones you get today so they hung straight and were beautiful – oh, and none of us, or our cats who liked to eat them – ever had an illnesses due to lead poisoning. 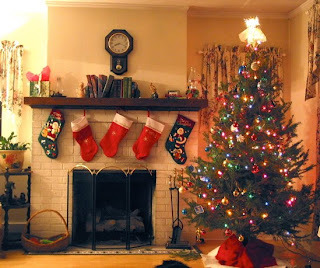 The tree was the center of our decorations and a focal point of the house during the Christmas season. 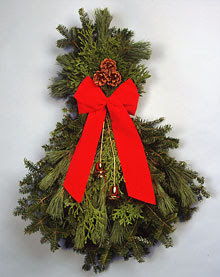 What memories do you have of your family Christmas tree? I want to spend some time and write about my memories, and I will, but I have to share this first. A friend of mine posted this and I recommend that you read it – it’ll warm your heart. This short story is the author’s memories of spending Christmas at his Aunt Ida’s house. It’s full of the things that Christmas should be about. It tells of what it was like when the living rooms at Christmas were filled with the sounds of families talking or kids laughing, not the football game on a 52" plasma; with families making memories and having appropriate conversations, not pieces of fractured families avoiding each other or talking about the latest celebrity gossip; of kids playing in a pile of coats, not holed up in a back bedroom playing the latest bloody combat video game and seeing images of life way beyond their years. Kind of made me stop in my tracks and remember what it means to have a family Christmas - not a "happy holidays" party; to be able to appreciate a personal, thought-out, given-with-love gift instead of another "picked-it-up-while-I-was-in-line-at-the-grocery-store" $50 gift card; to revel and take in with all my being the beautiful sounds, sights and magical wonder of Christmas instead of complaining about having to fight the crowds and traffic to "get my shopping done". It’s that tim e of year. Typically I try to do it in Thanksgiving week but I’ll be out doing it tomorrow. 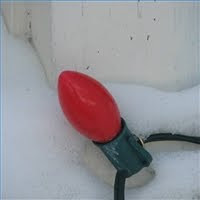 Yes – it’s the time of year to put up the Christmas lights… the outside Christmas lights. These days I have a nice set of lights that I have stored perfectly and that clip right into place… nice and neat. And although it’s going to be cold (mid-20’s) it’s all organized, ready to go and will be a fairly easy job. Growing up, not so much. 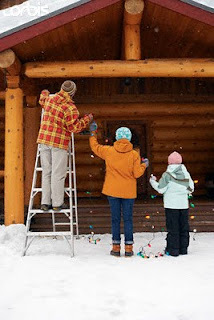 Growing up, putting up the lights was a chore. It was usually my Dad and me, and sometimes my younger brother. There were a few reasons that putting up our lights back then was so much work. To begin with – we used to put up a lot of them – all around our big deck and the entire perimeter of the house. Not a big house, but a lot of second story work. We also never seemed to do the exact design twice. I think that it was due more to the fact that every year another string would stop working or go missing. We used the big lights back then – the type where you screwed each bulb in – and it sometimes took forever to get them all working, and they got really hot and burned your hand if you grabbed them for too long. 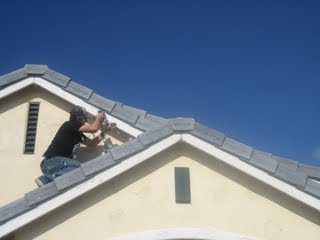 Probably the biggest thing was that we had to nail every string up, and we used old style brads and hammers. Nothing like holding trying to hold the lights taut, hold the tiny brads in place and trying to swing the hammer in the snow or cold weather. I have vivid memories of being very cold and wet when putting up lights… but they’re still good memories because they make me recall the great Christmases that I had growing up. It seemed like back then all of the neighbors in good ol’ suburbia put up lots of Christmas lights. 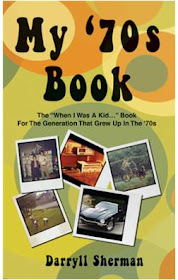 Then - in the early ‘70s, we had the energy crisis and everyone became very energy conscious. It was rare to see lights up on any house for awhile and it was pretty depressing. It seemed that many of the people never started putting lights up again after that… kind of used it as an excuse. Anyway – this would be a great weekend for you all to get your light up! Let’s get those neighborhoods a-glowing! Bangs. 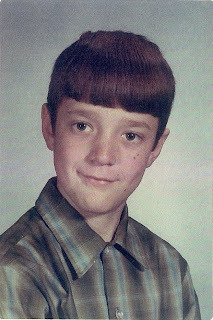 Did you have “bangs” when you were a kid? I know they were a big thing for girls, but remember how cool it was as a guy to have bangs? It was awful when it was haircut time – if you were like me, then mom did all the haircutting when you were young. She cycled through the styles… buzzcuts in the warmer months, and a decent covering throughout the rest of the year. How's that for an awesome school picture? circa 1968. I think my favorite was having bangs, ‘cause I loved it when they got long. It felt so cool to have them over your eyebrows and getting in your eyes. Of course we were emulating the Beatles and the more we could look like the Liverpool Lads, the cooler we felt. And we also used to let the hair grow and hang down in front of our ears so we had “sideburns”. Then we kind of looked like Mr. Spock, and that was really cool, too. As we got into High School, the bangs grew into “long all over” hair, with us constantly trying to whip our heads to keep it out of our face. And this eventually gave way to styled hair at “hair studios”. Oh, what a interesting hair tale we traveled. We never had them in school. We carried our stuff in ou r hands. We had books, Pee-Chees and notebooks, and we carried them. If the weather was bad, we put them inside our coats. We kept the supplies we used at school in our homeroom class and/or in our lockers. 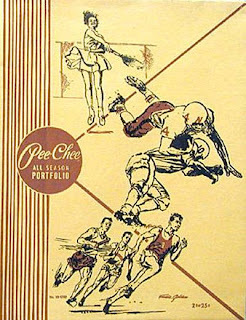 The fun thing about Pee-Chees was how we altered the drawings on them. More on that some other time. These days kids seem to have everything and are prepared for a weekend camp-out every day that they go to school. 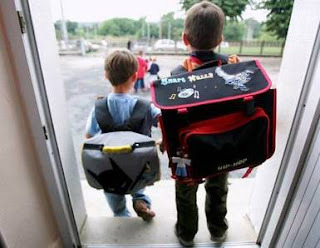 Often the backpacks are bigger than the little kids hauling it. A change of clothes; a local bus, regional train and international airplane schedule; seeds and starter plants to plant their own garden… who knows what’s all really in there. I just know that we seemed to get by just fine with a lot less. Britches. At some point in my life, I grew up enough to be wearing “pants” or “jeans”, or maybe even slacks. This did not, however, change the fact that my grandmothers would still comment on what a nice pair of britches I had on. It’s just one of those funny words that has, for the most part, gone the way of other words like trousers, stockings (guys socks – my dad still says this) and canvas high-tops. What things do you remember having when you grew up that have been "replaced" or "improved" today? I am very tha nkful that I have some great memories of Thanksgiving. I am very thankfu l that I have an awesome family and that we enjoy all getting together on Thanksgiving to celebrate and express our love and thankfulness for each other. 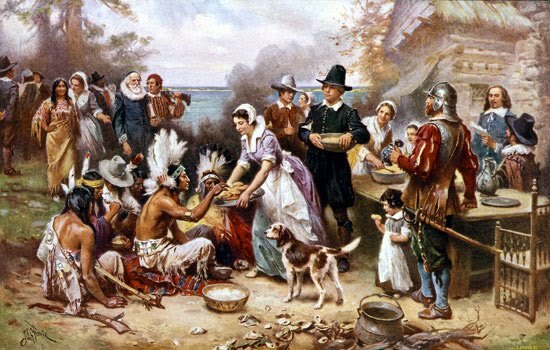 Growing up, Thanksgiving was kind of like the beginning of the magical time of Holidays. Well – maybe it started with Halloween. 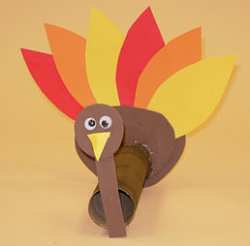 While Halloween meant that we cut out jack-o-lanterns and dress up, Thanksgiving meant that we got to cut out things in construction paper, glue together all sorts of fun things, do drawings and build forts. We got to dress up like Pilgrims and Indians. We got to talk about corn, maze, turkeys, stuffing, etc. We got to learn all about the Mayflower, Nina and the Pinta. We got to pretend that we were at Plymouth Rock and having dinner with our new found friends, the Indians. And of course, Christmas is now on the horizon! It was a simple time – and when you’re a kid, simple times and simple things are all you need – that and your imagination. I know this is all after the fact; I took a few days off at Thanksgiving and now I’m catching up. I do love the holidays and all that they represent. I am very thankful for all that God has given me… health, family, fun, love and laughter. I’ll get back to the ‘70s next time. I trust that you all had a great Thanksgiving will have a wonderful time in the next few weeks of family time.